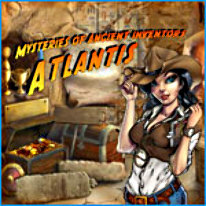 Find the treasures of Atlantis! A young archeologist discovers a fragment of a lost map that leads to the treasures of the most mysterious land - Atlantis! Carefully concealed by priests for future generations, the secret-filled Atlantis can just be seen protruding from dark waters. Anna starts her journey, visiting ancient cities and deserted caves as well as the sea bottom and ice deserts. Many amazing discoveries await!